MrQ Bingo is another new no wager bingo site to hit the market we have to say we are really impressed with this bingo site. We are sure this will become a huge site in the future. Take advantage of those truly free bonuses and judge for yourself. The bingo rooms, promotions and games on offer are amazing. The banking options do let this site down a little but nonetheless a great up and coming bingo site. With hundreds of bingo sites in the UK alone, it’s fair to say that the market is pretty saturated. It also means that there are quite a few unimpressive bingo sites, but MrQ Bingo is not one of them. A fresh arrival on the bingo scene, MrQ Bingo promises exclusive features and possibly the best bingo experience for all fans of the game. First and foremost, this impressive new casino has ditched all wagering fees for good. As the team proudly states on its website, they believe that online gaming should be fun, not require a calculator. By ditching the wagering fees, MrQ Bingo is taking the road less traveled for the good of the players. Of course, the bingo site isn’t going all in with no wagering fees only. Thanks to the huge selection of slots and bingo games, it will satisfy the wants and needs of nearly all bingo fans, even the picky ones. There’s 75 and 90-ball bingo, free and jackpot bingo for your pleasure as well as hundreds of slots developed by the best game studios in the industry. Available on mobile and desktop platforms as well, you can access your favorite games at MrQ Bingo anytime and anywhere. Depositing and withdrawing has been made easy with the inclusion of Visa, MasterCard and Pay by Mobile. The withdrawal times aren’t as fast as those instant payout casinos, but the withdrawals are more secure than ever. Although a newcomer on the bingo market, MrQ Bingo is a pretty promising bingo site. We have no doubt that over time it will improve further as an operator, and with those improvements, thousands of bingo fans will flood the site in a short time. Read the rest of our MrQ review to find out more! MrQ Bingo is full of promotions for players to take advantage of. Everything from free bingo, to bonuses to free spins – there is a lot here to take advantage where the winnings you get to keep as this is a no wager bingo site! The first is the offer of free bingo where you could win up to £150. All you need to do is sign up. Once you sign up you have 42 hours to access their “free for all” bingo rooms. you’ll be able to claim six free bingo tickets for each game during your first 24 hours. There are 30 games in total each with prize pots of £5. 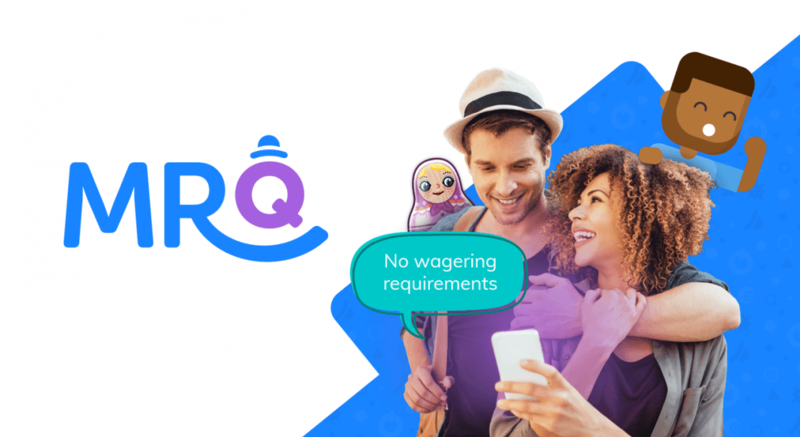 There’s no wagering requirements at MrQ so you keep what you win! This is quite a tasty way to jump right in and try this bingo site for yourself. Make your first deposit of just £10 and claim your 10 wager-free spins on Babushkas slot game. The 10 free spins are credited to your account straightaway and must be used within 48 hours. Sign up your friends and get 20 free spins to share. If you and a friend both sign up and deposit £10 you’ll both get awarded 10 more spins (in addition to the welcome offer). Once they’ve joined and made their first deposit, you’ll both get your free spins to use on Toki Time! Quite an unusual promo but MrQ bingo rewards players with 10 free spins on the Birds on a Wire slot game by Thunderkick, just for verifying your mobile phone number. To claim these free spins simply Log in to your account and head to your account settings, click ‘Click to verify’ button next to your phone number. Once done a text will be sent to your phone, you the need to enter the 4-digit number. Once complete you’ll be credited with the free spins. Like the other promotion you need to use those 10 free spins within 48 hours. Unfortunately, at the time of writing there isn’t a loyalty program available to Players at MrQ. Access and play bingo at MrQ on the go via your mobile device with ease. The mobile site is just as good the desktop one. There is also an app available to iPhone players that can be downloaded from the AppStore. MrQ is a great bingo with slots site, this site is ideal for bingo players who also enjoy playing slots (hence all the free spins promos). MrQ Bingo has a modest selection of slot games. The collection isn’t huge but the main, most popular and must fun slot titles are available to play. There are four ways you can get in touch with the team at MrQ should you need help. Details on this can be found on the contact us page. The site has a very informative FAQ page which will help answer the more basic questions. MrQ has a live chat feature for those who want help the quickest, this is available from 08:30 ’til 17:30 (except bank holidays and weekends). Players can also email support@mrq.com – responses are dealt with asap. If you prefer the old fashion way and want to call them direct they can be reached on 0203 384 2800. Phonelines are open 08:30 ’til 17:30 except bank holidays and weekends. MrQ have some good banking options and deposits and withdrawal processes. The down side is that MrQ only accept 3 options which include Visa, Mastercard and Pay by mobile. That’s a little disappoint if you’re a PayPal bingo user. Making a deposit at MrQ is very simple. All you need to do is Click Deposit (or + on mobile) in the top right corner of the Lobby and add either your payment card or mobile number. Then, select the amount you’d like to deposit and once you see the money in your balance, you’re free to start playing! The minimum and maximum deposits amount varies depending on method used. If you’re using Pay by Mobile, you can deposit a maximum of £30 per day and £240 a month. If you’re using Visa or a Mastercard, the maximum is £10,000* per transaction. Players can withdraw a minimum of £10, to do this players must Click the withdraw button then Select the card you want to withdraw to and confirm the amount. All processed withdrawals should be credited to your bank account within 3-5 working days. As no wager bingo sites go MrQ Bingo tops our recommendation of new bingo sites to try. If you love bingo and slots then this site is perfect for you. There isn’t that many bingo rooms but it’s a quality over quantity approach with 10 bingo rooms in total to play at. If you’re looking for a new site then MrQ is the one for you!